AT THE COURTYARD MARRIOTT IN REDWOOD CITY! 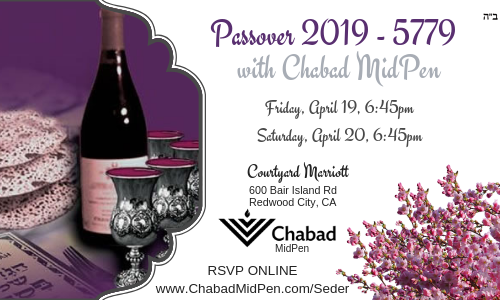 Enjoy the holiday of freedom at an inspirational Seder, complete with a gourmet Passover dinner, the original hand-made Shmurah Matzah, and four cups of exquisite Kosher wine. Journey with us through the Haggadah, with traditional songs, stories, and spiritual insights. Nobody will be turned away due to lack of funds. 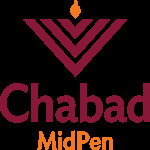 Please don't hesitate to contact us at rabbi@chabadmidpen.com, we will be happy to assist. Thank you for your reservation. We look forward to celebrating the Seder together. Chag Sameach. I would like to receive news and updates from Chabad of Redwood City by email. Nobody will be turned away due to lack of funds. Please contact the office at rabbi@chabadmidpen.com for assistance.